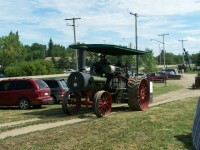 Since 1980, the DSPM has hosted an annual Museum Day the first Sunday of July in conjunction with the Ogema Agricultural Society’s (established 1914) annual fair. Occasionally this falls on the second Sunday in July. 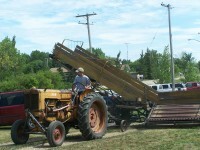 This weekend is an unofficial yearly homecoming for many Ogema and area residents, past and present. It also draws heritage enthusiasts from the surrounding regions and beyond. Museum Day consists of many family friendly activities and demonstrations. 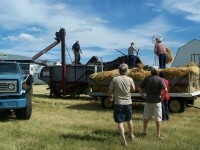 Most years there is a threshing demonstration. 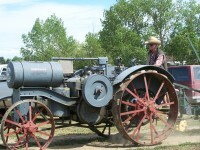 Other demonstrations include: rope-making, flour grinding, and blacksmithing. 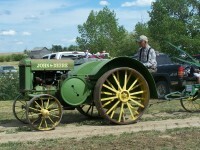 There is a pancake breakfast to start off the day, a church service, Old Tyme music and a parade of vintage machinery, in addition to a delicious lunch.